I love to start my day reading a little poetry. At random I pull down book of poetry from the shelf and flip the book open to an arbitrary page. Without judgment or censorship, I’m going to share whatever I find on that random page with you. I’d love to hear what you think about the poem and/or the poet, your reactions, what feelings or memories the piece evokes. 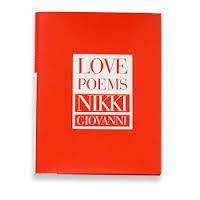 Today’s off the shelf selection is from Love Poems a collection by Nikki Giovanni. I heard her speak many, many years ago, and she gave some of the best advice ever: Spend your money on experiences, not things. She’s been so good for so long – quite an inspiration. I’d LOVE to hear her speak/read!! It’s on my bucket list, Janet.